Experience a weekend or more in fabulous Rocky Mountain National Park and come backpacking with our local, professional guides. Colorado Wilderness Rides And Guides (CWRAG) designs, guides, and provides the most unique and custom Colorado backpacking adventures imaginable. As a result of our intimate local knowledge, a world class national park in our backyard, the best professional team members, and superior logistical support, we will take you on a trip like no other. What Length of Backpacking or Multi-Day Hiking Trip are you looking for? 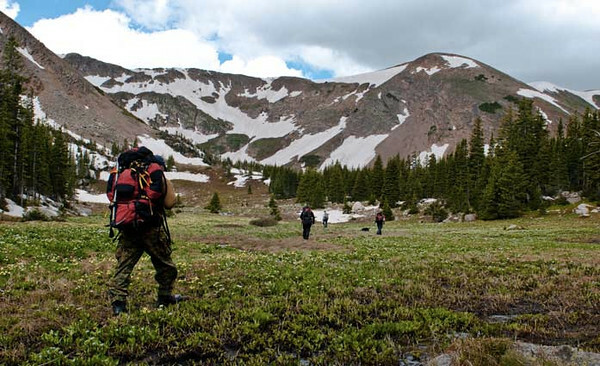 Colorado guided backpacking and multi-day hiking trips at their best! Whether this is your first guided backpacking tour or you have done many trips around the world, our Rocky Mountain National Park backpacking trips are truly unique! Our trips were specifically chosen and designed from our in-depth local knowledge of hiking trails and our experience from 20+ years of guiding backpacking trips on seven continents. 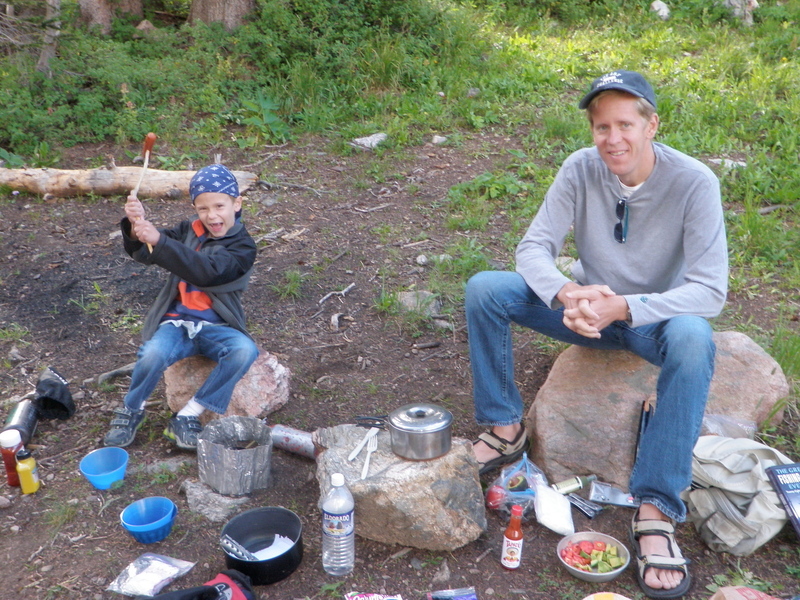 No one else knows Rocky Mountain National Park (RMNP) better than we do. Why go with non-locals, non-originals, or large travel agents, when you can go with the best (most personable, professional, and knowledgeable) local guides and guide service around? These amazing trips are sure to give you a taste of a “wilder side” of Colorado and a rare experience of hiking and backpacking in our spectacular Rocky Mountains. 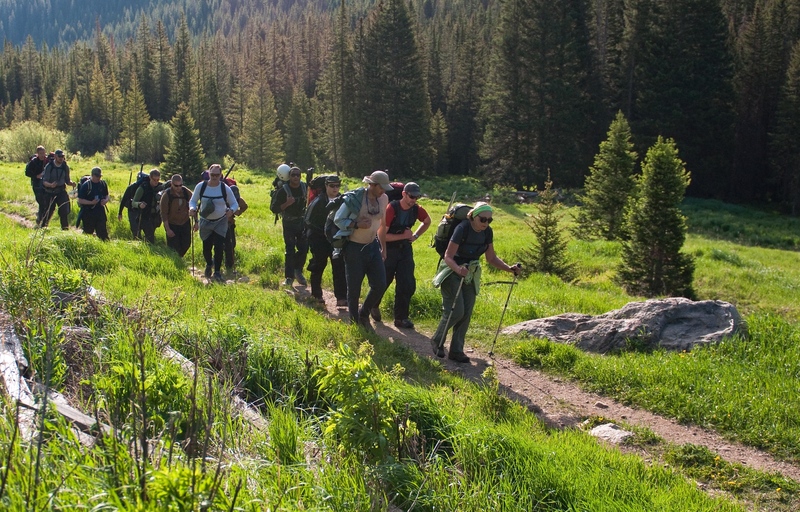 We have pre-set dates for our backpacking trips in RMNP – see the list below. Availability of other RMNP dates during the busy season is very limited, but we can create a trip for you during other times of the year or in other fantastic areas. 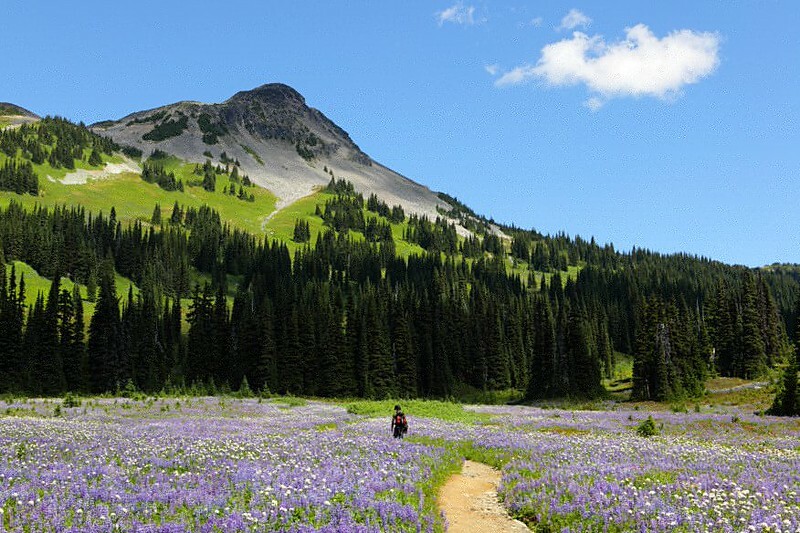 Our most popular backpacking trips are our 3-day trips. We design our guided backpacking adventures for groups of 2 or more who want to explore the wilderness with the knowledge and expertise of a professional guide. Our expert guides are trained in wilderness education and safety, and provide a more in-depth understanding of the geography, history, wildlife, and vegetation of the local area. We will plan an itinerary that meets your group’s goals and objectives. We have a multitude of different backpacking trips and locations from which to choose. Whether your focus is on wildlife viewing, majestic vistas, geology, or fly fishing, we can design a trip that exceeds your dreams. Your itinerary will also be based on your group’s time requirements, physical fitness level, and desired level of exertion or challenge. 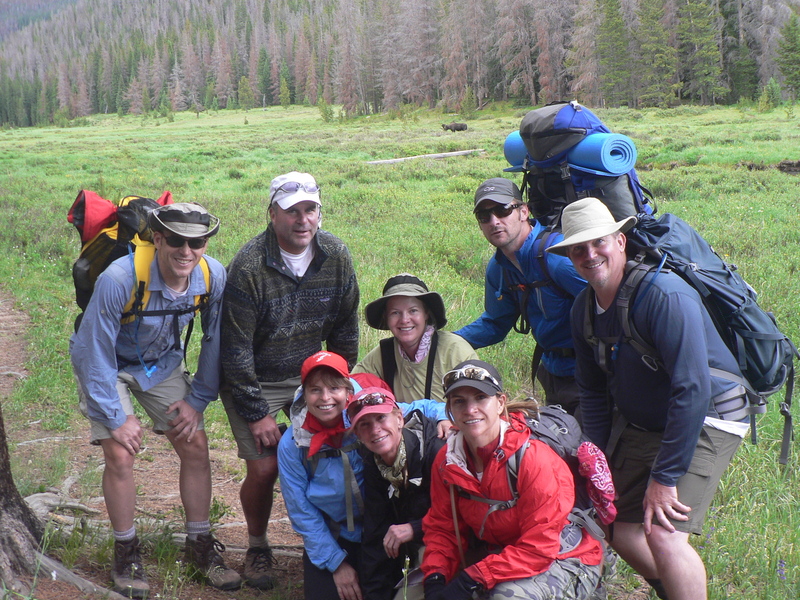 Our guided Colorado backpacking trips allow for increased education and dialogue about the area. 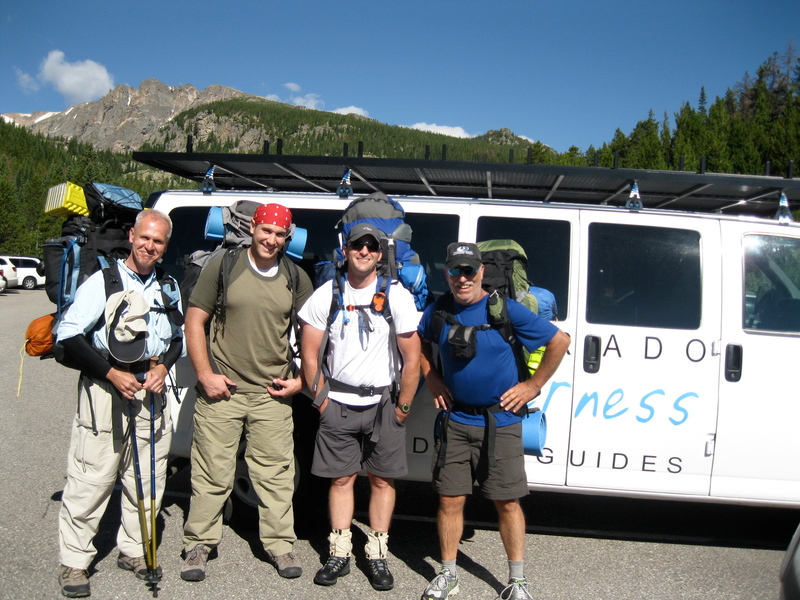 Your guide will teach you about traveling safely and preventing injury and altitude sickness. Our guides reduce the many risks that can be associated with mountain travel, such as misinterpreting terrain and weather, and/or losing one’s bearings. Colorado is known for weather that changes quickly and dramatically. Being lost in a thunderstorm or summer snowstorm can pose a serious danger and certainly isn’t much fun. Participants will not need technical gear. Your group will receive roundtrip transportation to/from Boulder, Denver, or Estes Park, Colorado. Our expert local guide will remain with you from the beginning of your backpacking trip to the very end. These trips are all-inclusive. We are a one-stop shop and the only guide service legally operating in RMNP who is also authorized by the State of Colorado and the National Park Service to transport passengers within the Park. 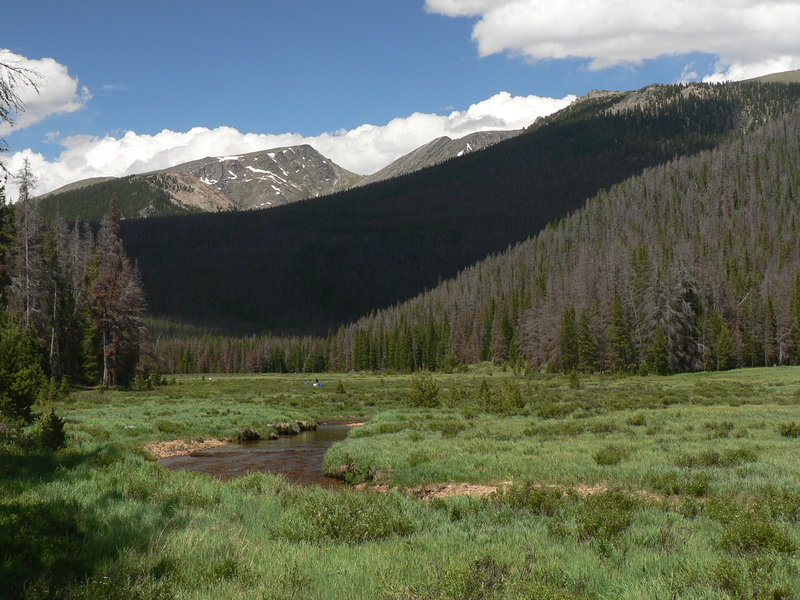 Rocky Mountain National Park, Roosevelt National Forest, and White River National Forest (Flat Tops Wilderness Area). CALL US FOR OUR 2019 TRIPS! 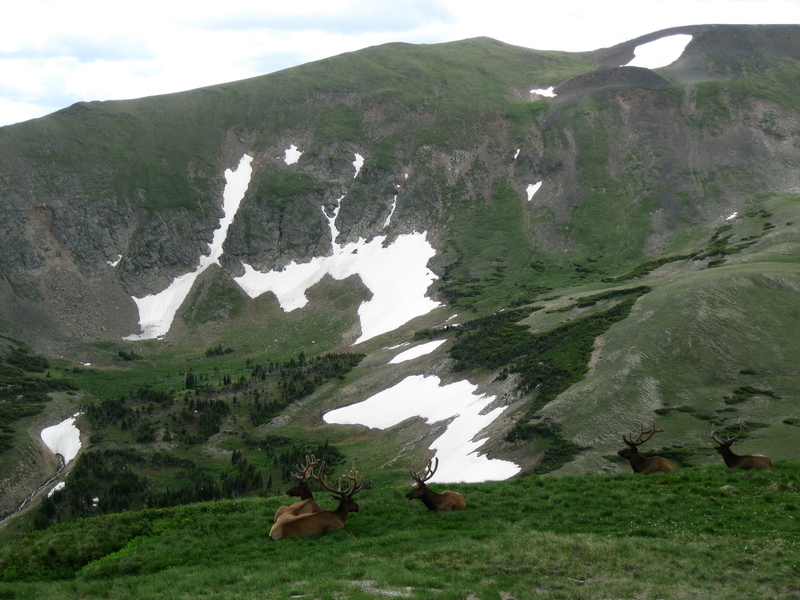 Please Note: Rocky Mountain National Park does not give outfitter dates until March 1st of each year. We do our best to try to get permits for specific dates, but sometimes these dates aren’t available. If you have specific dates you’re interested in, please let us know and we will try our best to get those. Come explore Wild Basin in Rocky Mountain National Park and get an opportunity to experience the spectacular southeastern section of the park. In the shadow of Mt. Alice, Thunder Lake lies in a majestic basin with wide-open views, abundant animal life, and the rugged unique beauty of the Southern Rockies. We will take two days to ascend to Thunder Lake, allowing time to acclimate to altitude, and then retrace our route back down on day 3. 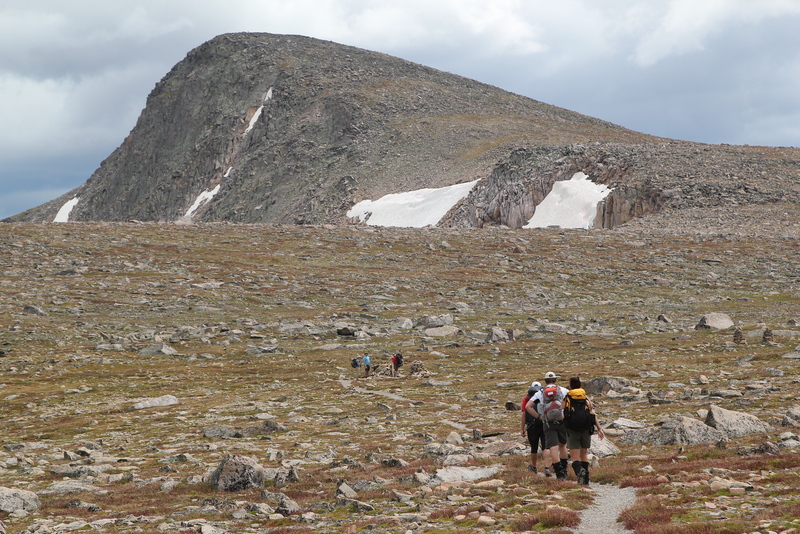 This is an ideal trip for those interested in transitioning from hiking to backpacking, anyone wanting a great introductory easy/moderate backpacking trip with family or friends, and for exploring this remarkable area in the backcountry of RMNP. This trip can be done as a 2-day (for experienced backpackers), 3-day or 4-day option. 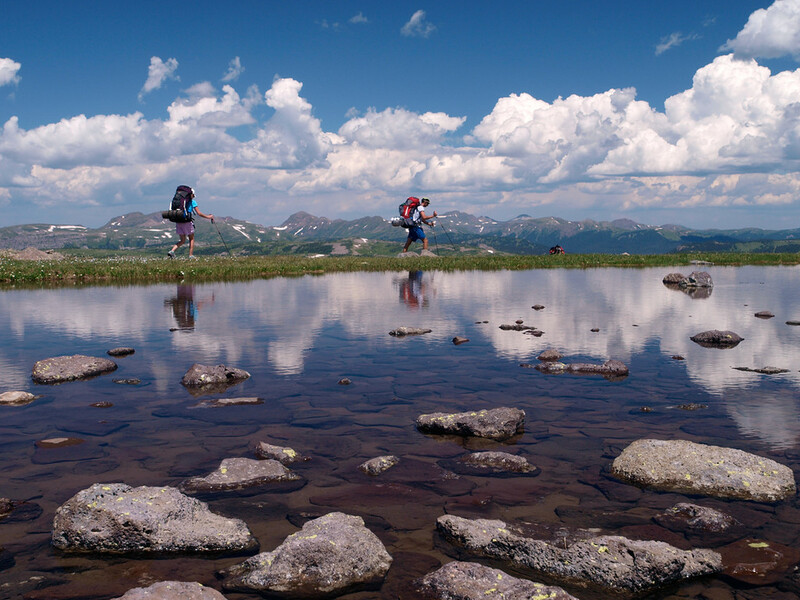 The Continental Divide Traverse is one of the most classic backpacking routes in Rocky Mountain National Park. This extraordinary excursion will take hikers into one of the deepest reaches of the park and some of its most spectacular alpine terrain. This route has thrilling Class 2 and 3 hiking and culminates in an ascent of Mt. Alice, one of the highest peaks in RMNP. It can be done over four, five, or six days. More days ensure a more leisurely approach and climb. Four-day trips are excellent for those who want to push themselves physically on a quick and challenging ascent. The area around Mt. Alice also provides some of the best alpine fly-fishing in Colorado with high lakes in a breathtaking environment of soaring mountains and pristine waterways. Colorado Wilderness Rides and Guides leads the way into this unforgettable Rocky Mountain landscape. 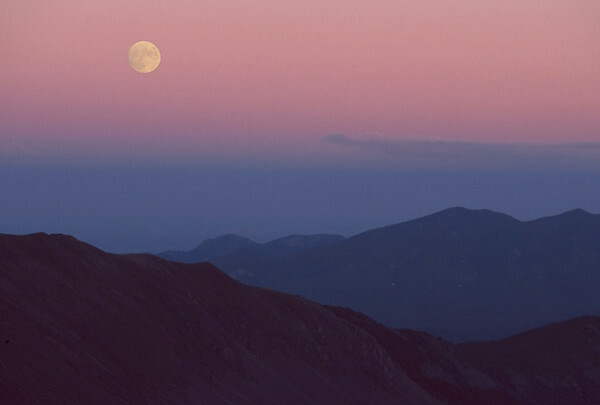 Explore the mysterious northern side of Rocky Mountain National Park as the Mummy Range reveals its secrets of towering 13,000-foot mountains, lush forests, shimmering alpine lakes, some of the best kept secret fly fishing in the Rockies, and a vast amount of high adventure in a less-explored area. 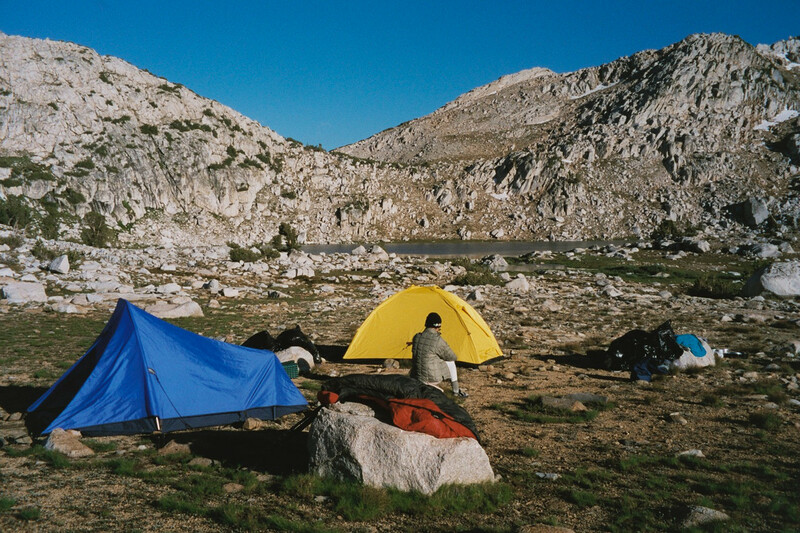 We’ll camp at two of the most secluded lakes in the park, and have opportunities to climb peaks such as Mt. Ypsilon and Mt. 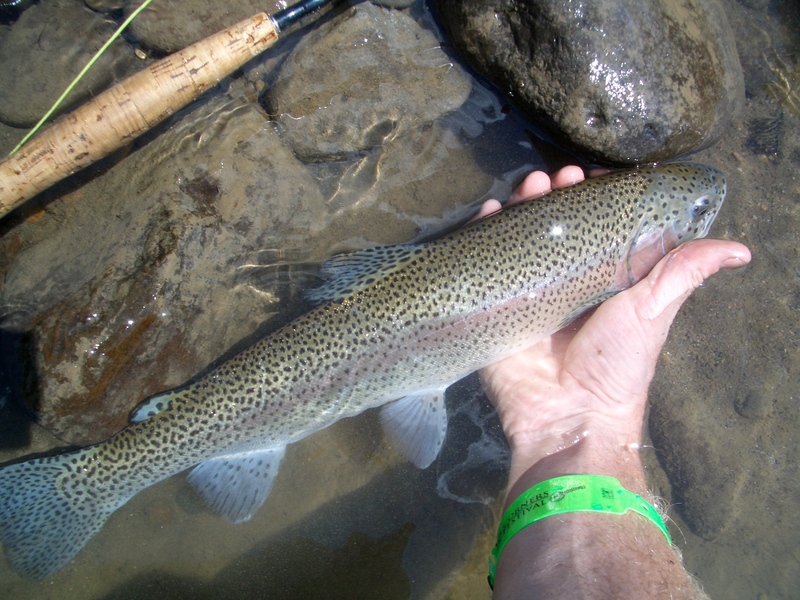 Chiquita, and to fly-fish for native Colorado species like the Cutthroat Greenback Trout. This is the perfect trip for those who want to see a part of RMNP that is rarely talked about, with some of its most iconic scenery. Big Meadows is perfect for first-time backpackers, families, and children, with a more moderate altitude gain and several trail options. 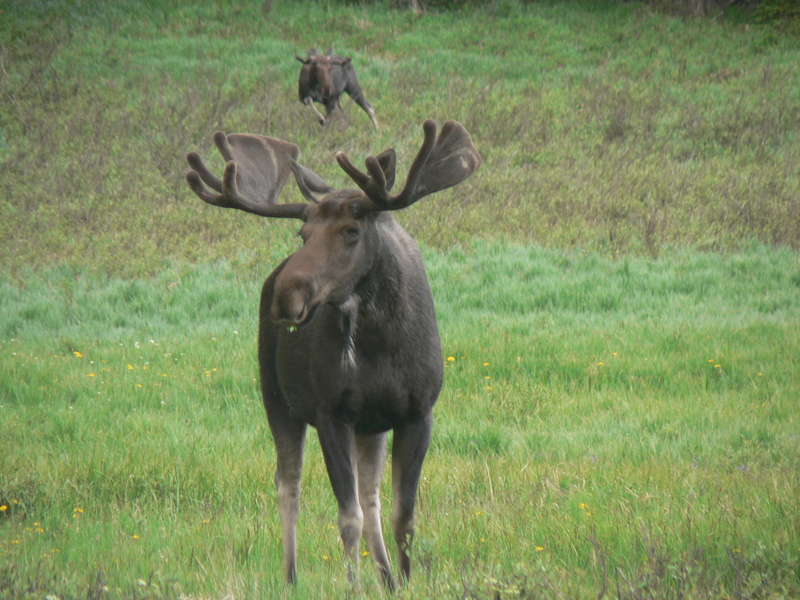 It has spectacular scenery overlooking wide-open terrain with wildlife such as moose, deer, elk, coyotes, and elusive black bears. This trail is easier and more leisurely but also offers more of RMNP’s gorgeous mountain scenery. For those who would like to fly fish, Big Meadows offers some of the best fly-fishing on this side of the Park, with wading for beginner and intermediate anglers. For families and beginner backpackers, this is the trip for you! IF YOU’RE INTERESTED IN OTHER AREAS, PLEASE CALL US AT 720-242-9828 AND WE’LL DESIGN A TRIP AROUND YOUR PREFERENCES! Included in our rates: The services of a professional guide(s); national park permit and backcountry camping permits; transportation between Boulder and the wilderness trailheads; all food during the backpacking trip; a re-supply drop, if necessary; gear for water purification and cooking; bear canister, tent, and medical kit; SPOT personal locator beacon, and contingency and emergency support. Not included in our rates: Meals while in the front country (breakfast on Day 1 and dinner on the last day); laundry; alcoholic beverages; hotel overnight before your trip and at trip’s conclusion; personal equipment (sleeping bag, sleeping pad, backpack – these items are available to rent); and gratuities for your guide(s) – while this is at your discretion, the recommended amount is 20%. We recommend optional trip insurance. Transportation to and from Boulder at the beginning and end of the trip. If you arrive from Denver International Airport, we will arrange transportation for you for an additional charge. If you are staying in Estes Park, we can pick you up and drop you off from your hotel or a central location. If you are staying in Denver, we will help arrange transportation to/from a central Boulder location. If you arrive by car, we can arrange for your car to be left, while we are out on the trip. Equipment rental cost for a 3-day backpacking trip: personal backpacking gear: backpack ($25); sleeping pad ($14); sleeping bag ($25). Optional: Fly fishing ($100 per person). Extra cost is due to the guide and equipment needed. Fly fishing license ($9 – $27 pp) is not included. Maximum guide to participant ratio is 1:4. Maximum group size is 12, including the 2 guides. We take pride in providing excellent meals in remote settings. 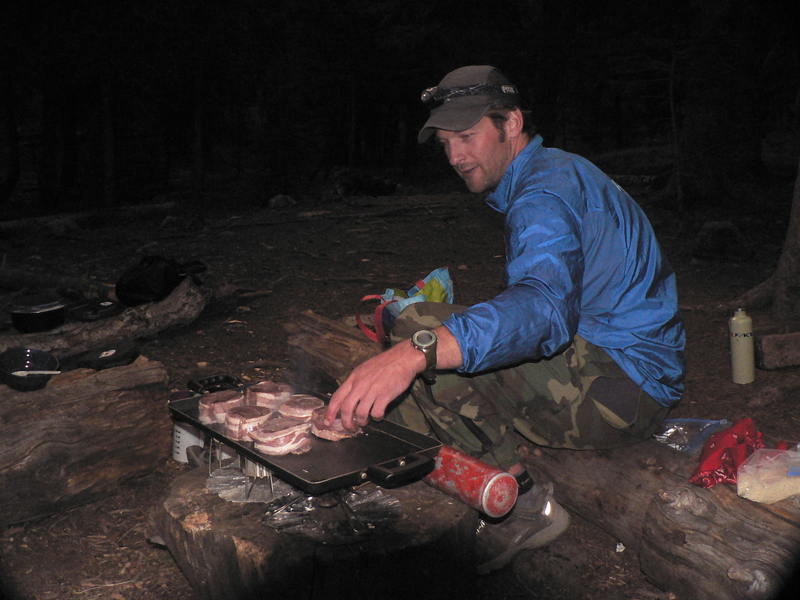 Remember, we are far from the road and trailheads, so our foods are not right out of the refrigerator. We accommodate dietary restrictions and preferences. Mornings will consist of cereals, bagels, burritos, etc. Lunches will include meat and non-meat sandwiches, hummus, veggies, etc. Dinners will include protein and carbohydrates to recover and refuel for the next day. We will be in the Rocky Mountains in June, July, August, and September. Our days tend to be long. 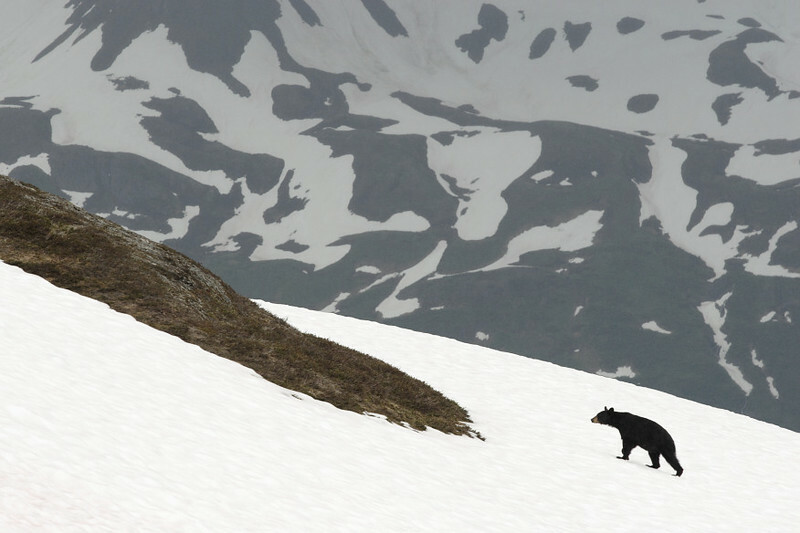 In June, snow may still be present on trails and campsites. Bugs (mosquitoes) will be present in July and early August, particularly in and around water sources. August brings fewer bugs and cooler evenings. September generally has the fewest bugs, although that can vary from year to year, with shorter days and cooler nights. The weather is usually warm during the day (60s and 70s F). The evenings will be in the 30s – 50s F, depending on the altitude and month. Afternoon thunderstorms are almost a daily occurrence. Storms are generally strong and brief, lasting less than 60 minutes. Lightning often accompanies storms, so we make sure we are below treeline by 2 pm. Windy conditions can be common above treeline. As in any big mountain chain, snow can fall at any time or month during the year, even summer. There may be some snow patches around the Continental Divide in July, but not enough to warrant an ice axe or crampons. Everyone asks this question, and for good reason. It all depends on the equipment you bring and the care you take in packing. We will help go through your gear before starting the trip and get rid of any luxury items not needed. These items can be stored with us and retrieved at the end of the trip. Personal and group gear should weigh less than 35 lbs for each person. For women, we recommend all personal gear weighing under 13 lbs, and under 20 lbs for men (this includes your backpack, sleeping bag and pad, and clothing). Regarding food weight, plan on 2-3 lbs per person per day. So, 2 days of food will be 4-6 lbs. Tent and fuel should weigh around 4 lbs per person. We will divide tent, food, and fuel evenly among the group. Your guide will carry a tarp, group medical kit, water purification, and communication device. Every group is required to carry enough bear canisters to hold all food and toiletries. Water weighs 2.2 lbs per liter. Plan on carrying 2 liters throughout the day. An equipment list will be provided when you book your trip. Please bring only what is on this list. The less weight, the better. We will send you a recommended exercise program and an outline designed for backpacking. If you have any questions about your fitness level or recommendations/questions about a fitness program, please call us. The best airport to fly into is Denver International Airport. Driving time between the airport and Boulder is 45 minutes to 1 hour; central Denver is 30 minutes; and Estes Park is about 2 hours. If you are driving, we will e-mail directions to you. Expect to be tired at the end of each day. This is normal, especially if you’re not acclimated to the altitude and exertion at altitude. You can expect living in close proximity to other trip members and guides for very full days. All trips are different because each trip is made up of different personalities, weather conditions, etc. Your guides will prepare each trip to suit the abilities and desires of the participants. You can expect a trip into Colorado’s backcountry that you’ll remember for the rest of your life. Our Difficulty Ratings for backpacking trips are based on a scale of Easy to Extremely Difficult (Easy, Moderate, Difficult, Very Difficult, and Extremely Difficult). 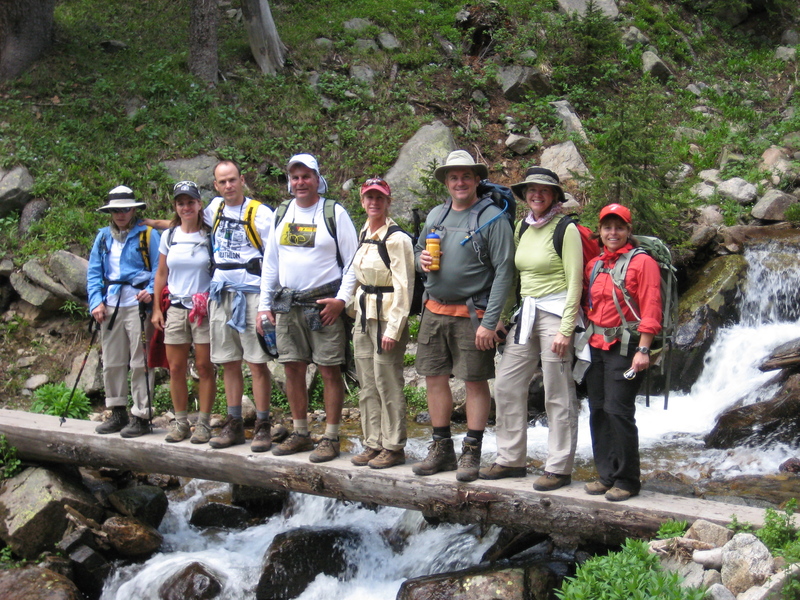 Easy – On our easy trips, you will hike 2-4 miles a day with 25-35 pound backpacks on maintained trails. Elevation gain/loss may be as much as, but not more than, 1500 feet. Altitudes range from 5,000 – 9,000’. 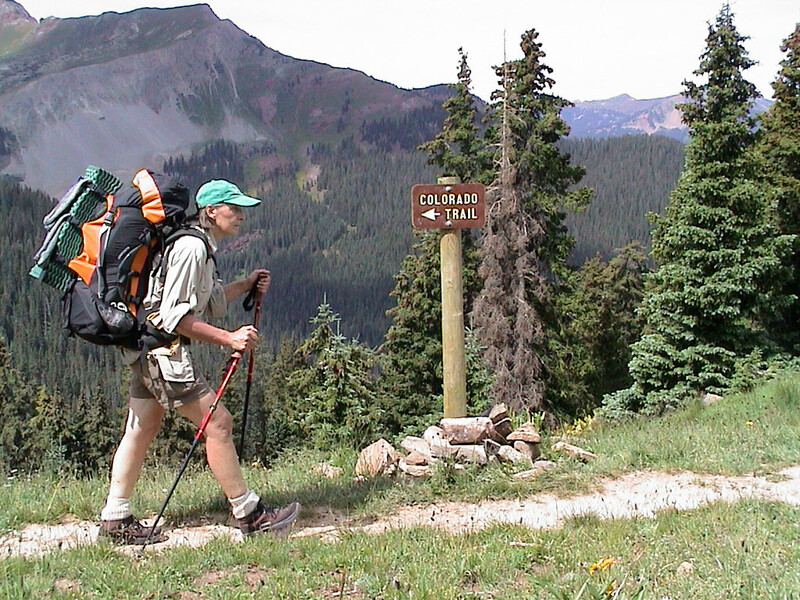 Moderate – On moderate trips, you will hike 3-6 miles a day with a 25-35 pound backpack on maintained trails. Elevation gain/loss may be as much as, but not more than, 2250 feet. For a moderate trip, you should be comfortable hiking 6-8 miles in hilly or mountainous terrain with a backpack. 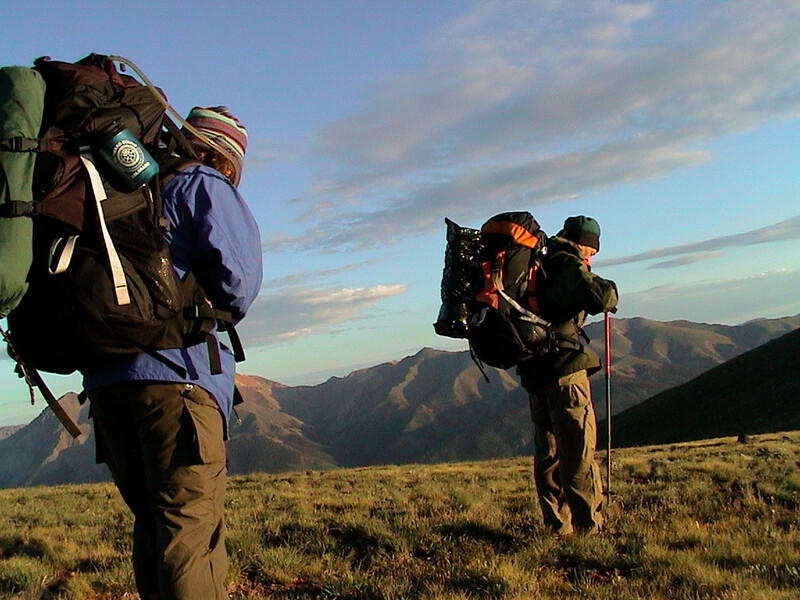 Difficult – On difficult trips, you will hike up to 8 miles a day with a 25-35 pound backpack. Elevation gain/loss may be as much as 3000 feet on maintained trails, or up to 2000 feet on more-rugged trails. For a difficult trip, you should be comfortable hiking 6-8 miles a day in hilly or mountainous terrain with a 25-pound backpack at altitudes of 7000’ – 10,000’. Very Difficult – Very difficult trips take place on rugged, unmaintained trails with larger backpacks (30-40 pounds). The hiking is often steep and steady with daily distances of up to 10 miles and an elevation gain of up to 4000 feet. For these trips, you should be comfortable hiking for several hours (3 – 6 hours) without many breaks and have previous experience exercising and sleeping at elevations of 7000’-11,000’. Trips take place at altitudes of 7000’ – 13,000’. Extremely Difficult – Extremely difficult trips involve hiking on very rugged trails or off-trail with backpacks of 35-45 pounds. These trips demand prolonged hiking with very strenuous, difficult sections. Terrain can be steep, loose, rocky and/or exposed (3rd class terrain). 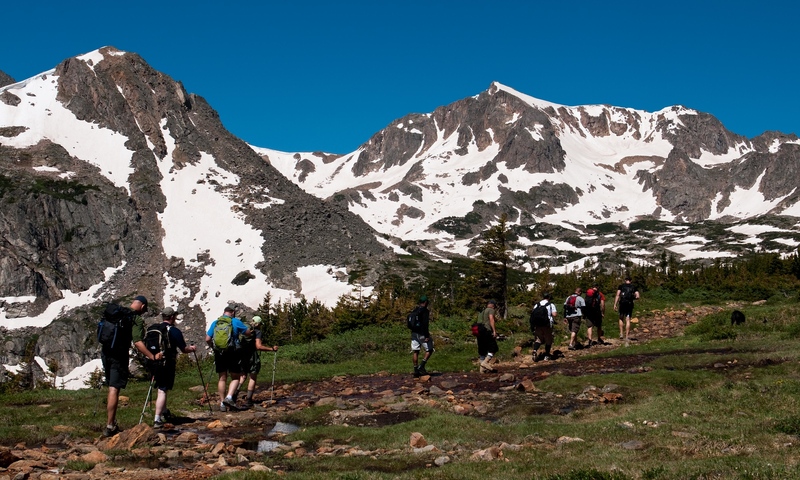 If you are considering an extremely difficult trip, you must be able to exercise vigorously for long periods (5-10 hours) and have previous experience exercising and sleeping at elevations of 10,000‘ – 14,000’. Trips take place at altitudes of up to 14,400’. Note on altitude: If you live at less than 2000’ in altitude, at 5000’ you will need to increase your exertion by 15% to achieve your normal pace; at an altitude of 10,000’ you will need to increase your exertion by 25% to achieve your normal pace; and, at an altitude of 14,000’ you will need to increase your exertion by 35% to achieve your normal pace.